Poland's countryside is dotted with numerous abandoned SAM sites, a lasting legacy of its Cold War role as part of the Warsaw Pact's air defense network. Numerous strategic SAM batteries played key roles in the Cold War, securing the Warsaw Pact's northern border and defending Polish and Soviet military units. The Polish strategic SAM network operated five different SAM types during the Cold War: the SA-75 Dvina and S-75 Volkhov (SA-2 GUIDELINE), S-125 Neva and S-125M Neva-M (SA-3 GOA), and S-200VE Vega (SA-5 GAMMON). The network was arranged in accordance with both barrier and area air defense concepts, with a contiguous SAM network along the northern coastline and clustered sites inland protecting key areas such as the capital. At first the strategic SAM forces were under the control of the Polish Army, but in 1962 they transitioned to the control of a new service branch, the Air Defense Army. The Polish Army would, however, operate the 2K11 Krug (SA-4 GANEF) and 2K12 Kub (SA-6 GAINFUL) tactical SAM systems. 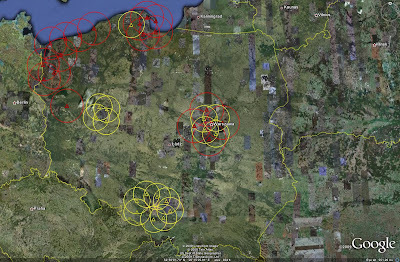 In the imagery contained within this article, SAM systems will be identified as follows: SA-75 sites are marked with yellow triangles and range rings, S-75 series sites are marked with red triangles and range rings, S-125 series sites are marked with blue triangles and light blue range rings, and S-200 series sites are marked with purple triangles and range rings. Soviet SAM sites are identified using the same color scheme but are marked with stars in place of triangles. Poland's strategic SAM network was born in a 1959 government decree determining that air defense units would be equipped with SAM systems. Crew training on the SA-75 Dvina began in 1960, with 26 batteries available by the end of 1963. The decision to obtain the S-75 Volkhov was also made in 1963, with training beginning in 1964. Nine SA-75 units would reequip with the S-75 and twelve new units would form by the end of 1971. In 1968 the S-125 was acquired and crew training initiated, progressing to the S-125M in 1978. Ultimately, 17 S-125 batteries would form, as well as nine S-125M batteries. 8 S-125M batteries would replace older SAM systems, in some cases even the shorter-ranged S-125. Poland's last Cold War strategic SAM acquisition was the S-200VE. Work towards that end began in 1985, with the battery becoming operational in 1987. 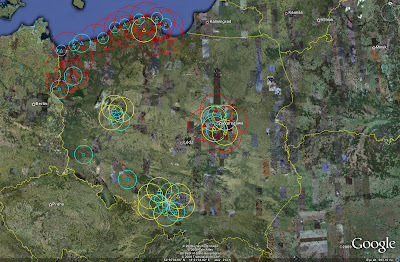 The following image depicts the layout of SAM facilities around Poland. It should be noted that not all of these sites were operational at any given time, this image merely illustrates the overall deployment strategies. Note the coastal barrier extending east from the DDR border to Gdansk, and the clustered arrangement of SAM batteries around major cities. Scattered around the nation are red icons denoting Soviet SAM sites, primarily S-125Ms tasked to defend Soviet airfields. Also of note is Bemowo Piskie, in the northeastern sector. This was the facility responsible for training Polish SAM operators and units. Due to the constant upgrades and expansion present within the Polish strategic SAM network, chronological analysis provides the most convenient method for viewing the network's status and capability at a given point in time. The following images will depict the SAM network as it existed for a given time period, accompanied by a brief analysis where appropriate. Soviet SAM batteries will not be included here as there is no documentation regarding their deployment timelines. 1966: SA-75 deployment had completed, providing the nation's first SAM network. 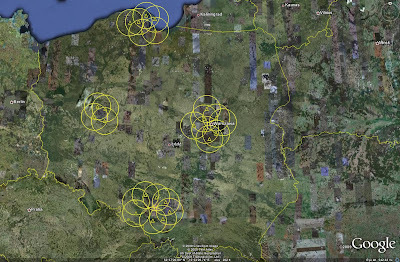 At this point the sites were positioned to defend key locations, being deployed in a quasi-circular pattern around their areas of interest. 1970: S-75 deployment was nearly complete. By this time, the framework for the coastal SAM barrier was in place, and select SA-75 batteries near Gdansk and Warsaw had been upgraded with the newer S-75. 1976: By this time S-75 deployment was completed, and S-125 deployment had begun. The coastal SAM barrier was complete. S-125 batteries were used to supplement the SA-75 and S-125 batteries, providing enhanced low-altitude coverage. 1977: By 1977 a solitary S-75 battery near Skwierzyna had been deactivated. This battery, the sole strategic SAM battery operated by the Polish Army, was reequipped with the 2K11. 1978: By the end of 1978, S-125 deployment was expanded around Katowice, and the first S-125M batteries had entered service. Warsaw S-125 batteries were reequipped with the newer, longer-ranged S-125M. 1984: By this time, S-125 deployments had taken place around Poznan, supplementing the SA-75 batteries already in place. 1986: S-125M deployment had been completed by 1986, with the system replacing select SA-75 and S-75 batteries near Mrzezyno along the northern coastline, Poznan, and Katowice. 1987: The Polish SAM network saw its last Cold War alteration by 1987, with the deployment of the S-200VE near Mrzezyno. Soviet SAM units deployed to Poland during the Cold War were established primarily to provide air defense for Soviet troop locations. Most commonly, S-125M batteries were emplaced on or near military airfields occupied by the Soviet military. Identified Soviet air defense deployments included two S-75M batteries and four S-125M batteries. Soviet air defense deployments in Poland were apparently far less robust than they were to the west in the German Democratic Republic (GDR). The reason behind this is likely due to the fact that high-performance Su-27 (FLANKER-B) air superiority fighters were based at Soviet-occupied airfields, providing a far more capable air defense asset than any S-75 or S-125 variant. Also, it was likely believed that any attacking force having penetrated through the GDR and Polish SAM and interceptor nets would be more readily dispatched by available air assets. An apparent S-300PS (SA-10B GRUMBLE) emplacement near Warsaw provides the only indication that the system was considered for deployment to Poland. Given that there is no evidence to suggest that the Polish government has attempted to purchase the system in the past, the likely operator would have been the Soviet military. 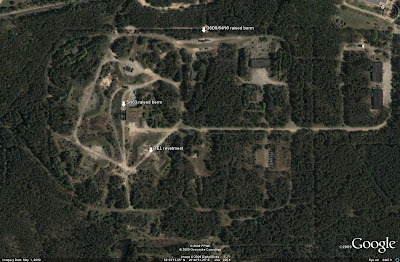 The site was in use as recently as 2002 by the Polish military, most likely to support EW assets which would be able to take advantage of the raised berms initially constructed to enhance the fields of view of the S-300PS's 5N63S (FLAP LID B) engagement and 36D6 (TIN SHIELD) or 64N6 (BIG BIRD) EW/battle management radar systems. 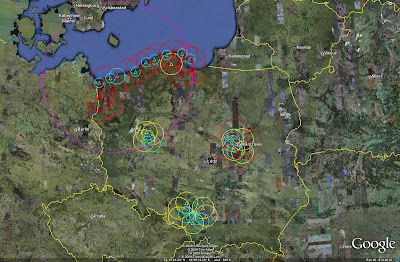 While the network appears at first glance to contain a significant number of open areas, particularly in the southwestern, central, and eastern portions of the nation, the network must be analyzed in the context of the entire Warsaw Pact air defense network. The GDR was likely to serve as the front line of any conflict with NATO, and as such enjoyed a much more contiguous SAM network. The majority of the Warsaw Pact's SAM defenses were consolidated in the GDR, and in western Czechoslovakian territories closest to the West German border. Polish airspace was therefore protected by these networks, their presence acting as an external SAM buffer zone. This may in part explain why Poland continued to rely on the older SA-75 Dvina in greater numbers throughout the Cold War; Czechoslovakia and Hungary, for example, had phased the system out by 1989. The limitations inherent in the Polish strategic SAM network were ultimately the same shared by its allied states: reliance on outdated Soviet weapon systems. The SA-75, S-75, and S-125 were all single-target command-guided systems, able to engage one target per engagement radar and vulnerable to ECM interference with either the engagement radar or missile guidance command link. However, even these limitations should be taken in context; the Warsaw Pact did not see itself fighting a defensive battle for an extended period and as such the limitations of Polish systems deployed well behind the predicted front lines would have been mitigated by Soviet Army advances into the heart of NATO. Ultimately, Poland's strategic SAM network was well designed to serve its purposes, even if the systems themselves became more susceptible to Western electronic combat systems as the Cold War continued. Following the end of the Cold War, the Polish strategic SAM network began to see a number of changes. In 1990, the SA-75 was finally removed from service, with the S-75 following in 2001. Poland has relied almost solely on the S-125 family since 2001, developing a mobile variant dubbed the Neva-SC featuring truck mounted engagement radars and tank mounted launch rails. The only other holdover from the Cold War period is the S-200VE. Poland's strategic SAM network played a critical role for the Warsaw Pact during the Cold War. The coastal SAM barrier guarded against NATO incursion into one of the Warsaw Pact's main resupply and logistical areas, and would have aided in protecting naval units transiting from the Baltic Sea. Although its strength waned following the Cold War, at strength it was a critical component in the Warsaw Pact's overall air defense strategy. 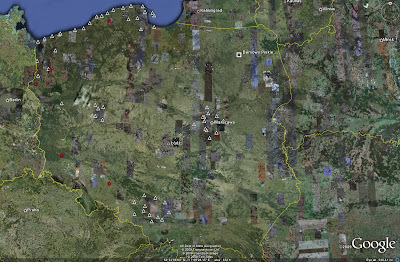 A Google Earth file containing the placemarks and range rings used in the generation of this article can be downloaded here. SAM range data taken from various editions of Jane's Land-based Air Defence, and from Fakel's Missiles, an unclassified Fakel publication detailing the bureau's missile development. The gap of almost 50kms between Praha(Prague) and Brno in the short range SAMs (Czechoslovakian)is very clearly seen in the last image of Western Warsaw Pact circa 1989. It was covered by a very simple deployment of S-125 battery at Skarbimierz Airfield by USSR. The four USSR S-125s already identified by you have been missed out in that image. They could be added to give a complete overview of Western WP deployment. Deploying the S-125M to Skarbimierz in Poland won't close the gap between Prague and Brno. 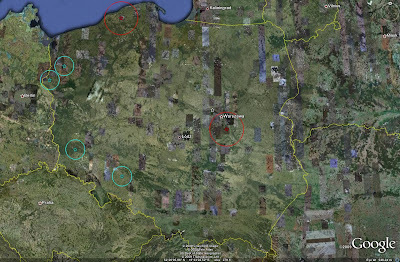 And yes, I did forget to turn on the rings for the Soviet sites in Poland when creating that image! I might fix the image at some point, but it won't really affect any of the analysis. I am going to do an overview of the entire WP network (minus the USSR) once I get done with the individual nations. Good article! Great pictures and maps! Is there any chance you could do the same for the other side, NATO / France / US in Europe? That would give this article and its gorgeous maps perspective and more realistic possibilities for interpretation. I realize it's a lot of work but it would be mightily appreciated. I lived through those years and it is a more than good thing to finally, in retrospect, see and read what it was all about. We have been lied to a lot then; hight time the truth comes out. Thank you for your contribution to a valid assessment of the past.